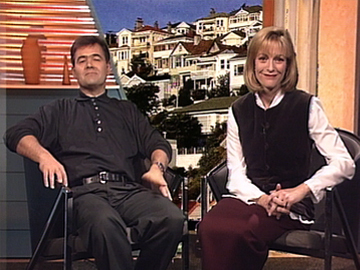 Open Home was a 90s series looking at New Zealand homes and the people making, designing and living in them. This episode from the third season ranges from deconstructionism to DIY. Builder (and future Dunedin mayor) David Cull checks out a Northland glasshouse designed by Nigel Cook, before visiting the renovated Australian farmhouse and digital recording studio of Dragon band member Todd Hunter. Susan Wood tries translating the architectural theory of deconstructionism with the help of Auckland architects, including Mark Wigley.